​Excelwave Technologies' ERSAFR series signal boosters are carrier grade 15dBm single, dual, triple, quardruple and quintuple bands frequency agile indoor signal boosters covering single or multiple networks within one unit. The uplink and downlink frequencies for each of the bands are field programmable with fixed bandwidths,which allows the unit to operate at the exactly licensed frequency block. The triple band 15dBm indoor band selective signal booster ERSAFR3-245P15G65S, supports band B2, B4, B5, full or partial of the bands for 2G, 3G and 4G Networks in North America within one unit. ​ERSAFR3-245P15G65S is a carrier grade 15dBm triband indoor signal booster covering the major carriers’ 2G, 3G and 4G networks in North America within one unit. 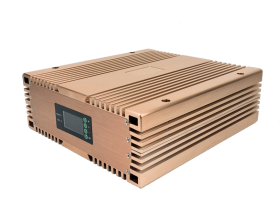 This triband booster can provide 15dBm maximum output power and 65dB gain simultaneously for signals in band 2, 4 and 5, offering uninterrupted voice communication and consistent high data throughput in office, store, café shop and underground parking. Each band can be fully covered or partially covered through pre-sett bandwidths at factory. The uplink and downlink frequencies are field programmable with the preset fixed bandwidths. This feature offers great flexibility for material planning, inventory control as well as cost effective solution for frequency re-banding. The customizable bands, high out of band compression, low spurious emission, low intermodulation, control and high energy efficiency design creates clear and green communication environment. Built-in AGC and ALC allow stable output power even when the mobile is close to the repeater, which protects the donor site from interruption. The unit is housed by a compact and light alumina casting enclosure. The built-in LCD control panel allows the repeater operation frequencies and gains be configured and optimized easily on site without additional tool. Signal strength indicator and uplink and downlink input and output power readings help find donor signal source and set up the system in the field without additional equipment. Please contact sales@excelwavetechnologies.com for any other custom combinations. Excelwave Technologies' ERSAFR1 series signal boosters are frequency agile indoor signal boosters. The uplink and downlink frequencies are field programmable with fixed bandwidth, which allows the unit to operate at the exactly licensed frequency block.